"It's always been my dream, you know, growing up, watching the Bruins. Even today, I still dream about it. I don't think a guy who hasn't won a Stanley Cup doesn't sit there and think about lifting that cup over their head." Other Stars: Wayne Gretzky, Steve Smith, Jeremy Roenick, Mark Messier, Bobby Holik, Brendan Shanahan, Darren Pang, Kris Draper, Steve Yzerman, Igor Larionov, Emile Francis, Al Arbour, Patrick Roy, Rod Gilbert, Cammie Granato, Joe Mullen, John Tonelli, Darryl Sydor, Pete Peeters, Darryl Sittler, Ron McLean, Lanny McDonald, Theo Fleury, Martin Brodeur, Glen Sather, Billy Smith, and many more. In 1892, Frederick Arthur, Lord Stanley of Preston and Governor—General of Canada purchased an ornate silver bowl for 10 guineas (about $48) and donated it to serve as a trophy for the best amateur hockey team in Canada. Since 1910, when the newly formed National Hockey Association started using this trophy, it has been a symbol of professional hockey supremacy. In 1926, the National Hockey League started using the trophy and it has been in their sole possession since 1946. The Stanley Cup, as this trophy has been called since its inception, is the oldest trophy that professional athletes can compete for in North America. It is also the only trophy for a team sport that bears the engraved names of its winners—not just the team name but the names of the players and coaches as well. The Stanley Cup is a trophy steeped in history. A lot of crazy things have been done with it and to it by the players that have won it over the years. Just in recent years, the Cup has made appearances on stage with strippers, been used as a peanut dish, filled with raw oysters, slept with, thrown into swimming pools, used as a feed bag for a Kentucky Derby-winning racehorse, taken onto late night talk shows. Most incredibly, however, it was once used to baptize a child. Despite this unusual history of "abuse," to be able to hold the Stanley Cup over one's head and kiss it, to drink champagne from it, to have your name engraved on it, is the ultimate dream of every young kid that has ever strapped on a pair of hockey skates. Lord Stanley's Cup: Hockey's Ultimate Prize seeks to document the incredible fanaticism, among players, coaches, and fans, that revolves around the quest for this ultimate prize in professional hockey. 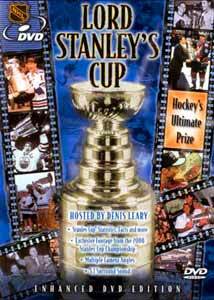 Hosted by actor/comedian Denis Leary and narrated by John Hefferman, this 40-minute program compiles game footage, celebration footage, interviews with fans and celebrities, and modern interview segments with some of the game's greatest, past and present, to document the phenomenal spirit that goes into the yearly quest for Lord Stanley's Cup. If you are looking for a cohesive history of the league, this isn't it. As a matter of fact, this program lacks cohesion to the point of fault. The background history of the Stanley Cup is covered, but only briefly. Some archive footage is included but the program is definitely biased towards game film from the last fifteen years. As such, Lord Stanley's Cup doesn't accomplish much as an educational experience. It does, however, score a lot of points for its pure entertainment value. Fans of the sport should find this disc to be a nice addition to their collection. Lord Stanley's Cup: Hockey's Ultimate Prize is one of four team sports-related DVDs being released by USA Entertainment in the month of October. The others are Greatest Moments in Super Bowl History, Greatest NBA Finals Moments, and <b>Major League Baseball: All Century Team. Image Transfer Review: Because so much actual game footage is included in the main program, and because the age of this footage ranges from this year to 80 years ago, video quality of the footage itself can vary dramatically from very good to not so hot. This is to be expected. The interview segments feature nice colors and detail. Some faint graininess is present in a few of these shots but nothing too distracting. The segments featuring Leary are of noticeably lower quality, with reduced detail and much more pronounced graininess. Audio Transfer Review: Lord Stanley's Cup claims to be in Dolby Digital 5.1. This is true and untrue. Yes, the program is encoded to play through all six channels. However, there is no independent surround channel or LFE coding. For all intents and purposes, this disc contains a 5-channel stereo sound mix. Your subwoofer will show some activity but only in bolstering the low end of the stereo sound. As with the image quality, the audio for the actual game footage varies somewhat depending on the age of the footage. Overall, the sound is just slightly muddled but nicely enveloping. Your pulse will quicken quite nicely listening to Gary Thorne and others scream "he scoooooores!!!" Dialogue during the interview segments is generally very crisp. Like with the video, the audio during the Leary commentary segments is of lesser quality, exhibiting duller, more muted sound. Playoff stats for 12 of the greatest players. Chronologial listing of all Stanley Cup winners and runners up as well as Conn Smythe trophy winners. Complete Hockey Hall of Fame members listing. Extras Review: Lord Stanley's Cup comes with a very nice batch of extra materials. First and foremost, three additional video presentations are included. "'99 Finals — Game 6" is a highlight film of the dramatic triple-overtime Dallas/Buffalo contest. Narrated and complete with some fantastic game footage, it runs about seven and a half minutes. In a similar fashion, "2000 Finals— Game 6" highlights the final game of this year's New Jersey/Dallas Stanley Cup finals. A third video presentation, "Money Players", takes a quick look at some of the greatest Stanley Cup playoffs clutch performers in hockey history. The players spotlighted in this 3-1/2-minute video are Billy Smith, Grant Fuhr, Bernie Parent, Terry Sawchuk, Patrick Roy, Claude Lemieux, and Esa Tikkanen. Video and sound for the first two videos are comparable to the feature presentation but, for some reason, the sound for "Money Players" is very muted and indistinct. Several text-based extras are also included. The "Players" section presents the playoff stats of twelve of the game's greatest post-season performers, including Wayne Gretzky, Mark Messier, Maurice Richard and Mike Bossy. Additionally, a chronological listing of each Stanley Cup winning team, their coach, and the runner-up is also provided, as well as a chronological listing of every Conn Smythe trophy winner. A complete alphabetical listing of the members of the Hockey Hall of Fame is included as well. A brief bio of the program's host, Denis Leary is also offered. Lastly, those with a DVD-ROM drive can access web links to various hockey sites. Lord Stanley's Cup features a very attractive animated menu complete with animated transitions and music. Comprising the hockey entry in USA Entertainment's new series of sports DVDs, Lord Stanley's Cup: Hockey's Ultimate Prize is a bit lacking in the history department but deserves high marks for entertainment value. This should be a welcome addition to any hockey fan's DVD library.